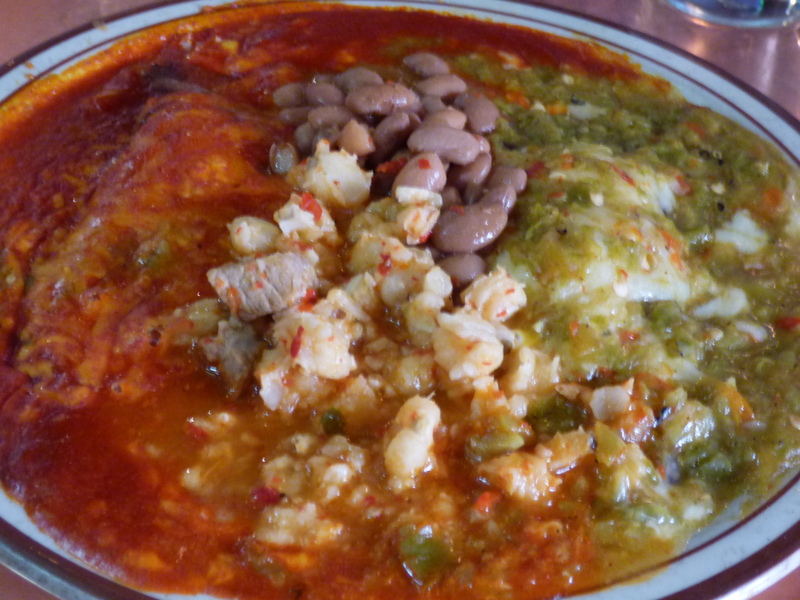 Santa Fe is renowned as a food-lovers heaven, with New Mexican cuisine leading as Archangel. The food is spicy, vibrant, flavorful and oh-so-delicious. 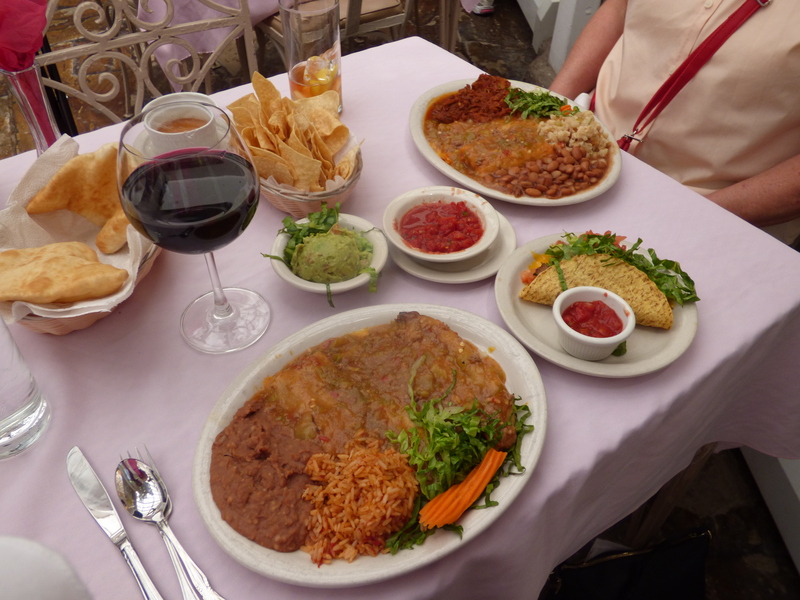 The quality, whether New Mexican or standard American fare, is outstanding. Could it be the altitude? On my first visit in January, I commented to a friend that the salads tasted alive and fresh–the colors brighter, the taste crisper. New Mexico is known as The Land of Enchantment, and my friend joked in return to my comment on the salads that it’s really The Land of Euphoria. And perhaps that’s somewhat true. 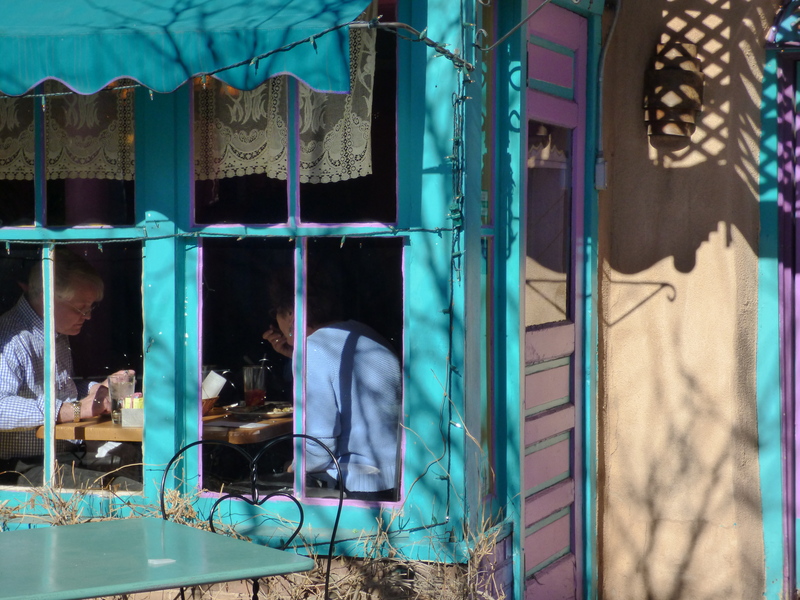 No matter the reason, the food journey in Santa Fe and beyond is truly a euphoric adventure not to miss. 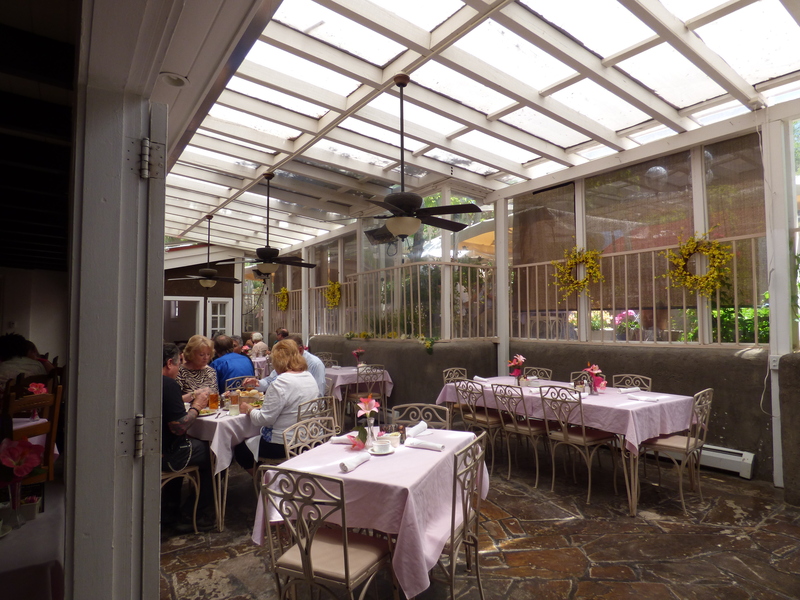 Diners enjoy lunch at The Shed. One taste of the green chile sauce and my taste buds went numb. After that, nothing seemed very spicy. I asked the waiter, “Which sauce is hotter: red or green?” He responded that most folks think the red sauce is spicier. The green sauce was deep and hearty while the red sauce had a smoky flavor to it. Both were delicious and I was happy my friends recommended I order my meals “Christmas,” so I could sample both flavors. 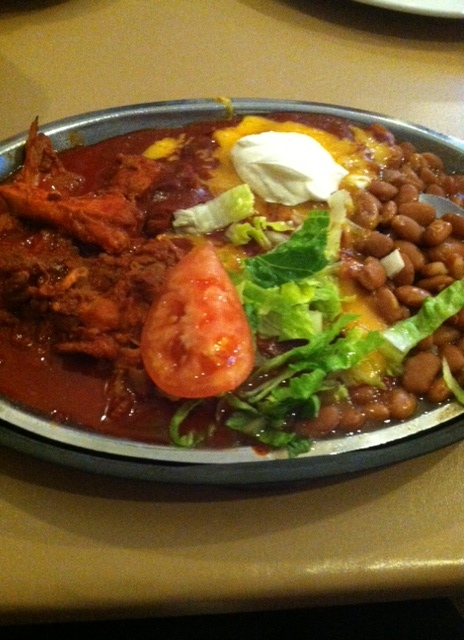 Blue corn wrapped cheese enchiladas with red and green sauce served with posole and beans at The Shed. But before I seared my taste buds, there was the salad. Perhaps the best salad I’ve had. Maybe it’s the closeness to the sun, a longer growing season, or even the local availability of fresh produce, but the lettuce was vibrant and crisp. Top it with blue cheese, walnuts, Kalamata olives and a balsamic vinaigrette, and it’s near perfection. 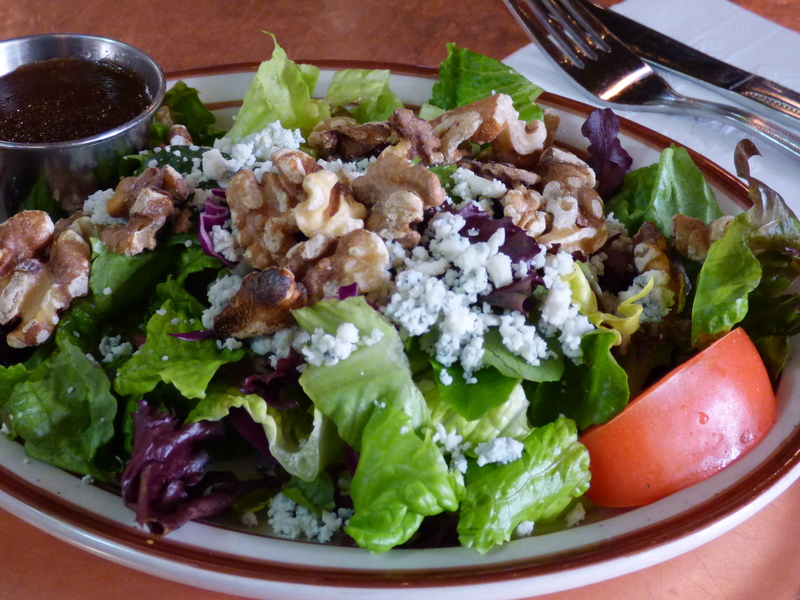 Blue Cheese and Walnut Salad at The Shed. 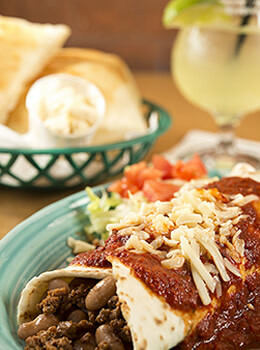 A blend of New Mexican and Mom’s home cooking waits for you at the Plaza Café. 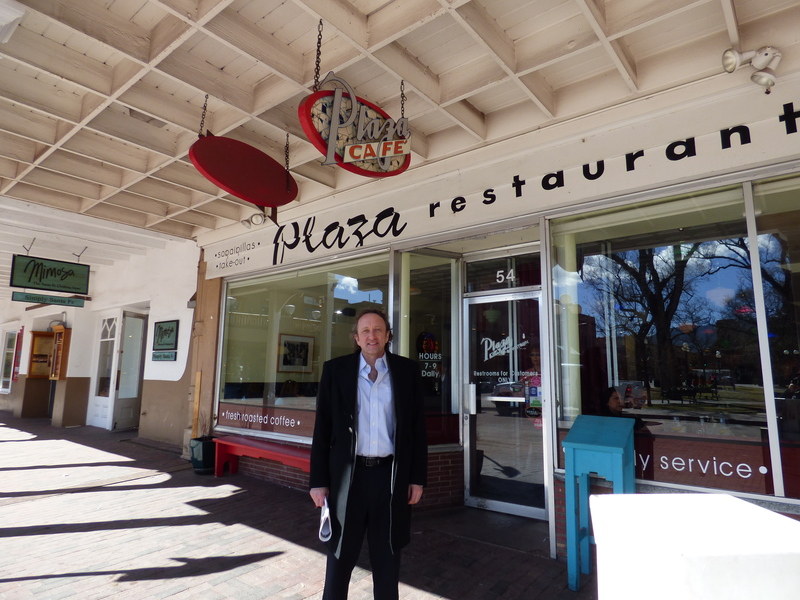 Whether you’re craving blue corn pancakes, a salad, New Mexican food or down-home comfort foods, the Plaza Café has them all. After a 16-hour train ride, I was craving something soothing, and the Cafe’s Original Chicken Fried Steak delightfully filled the need. 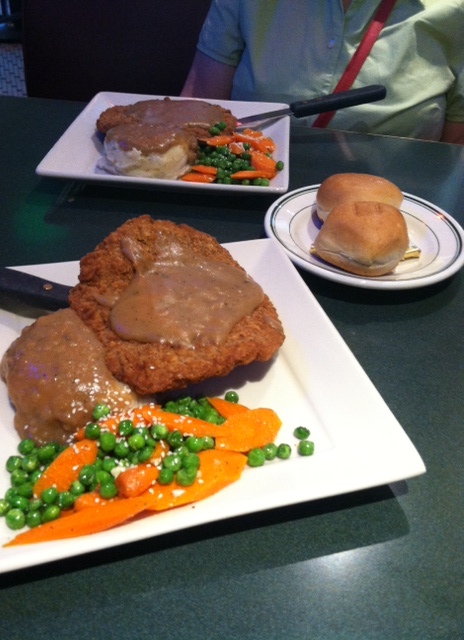 Chicken fried steak, mashed potatoes with brown gravy and mixed vegetables at the Plaza Café. Meeting a friend for breakfast at the Plaza Café. After a long morning walking the Plaza in Santa Fe, a friend and I popped into Tia Sophia’s. We were greeted like family, which I later learned is common practice at this humble, yet delightful restaurant. The restaurant serves breakfast and lunch, closing at 2 p.m. each day. We split the Polo Adovado, chicken marinated and simmered in a rich red sauce, and ordered their huge, fluffy sopaipillas for dipping. My friend mentioned the breakfast burritos are worth a second trip back. I have it on my to-do list as this unintimidating restaurant serves top-notch New Mexican fare. Pollo Adovado at Tia Sophia’s. The Amtrak train from Lamy to Albuquerque was delayed six hours, so I decided to take the New Mexico Rail Runner Express instead. The train was departing earlier than I’d planned, so my friend Patty agreed to pick me up and treat me to some Santa Fe “fast” food on the way to the station. 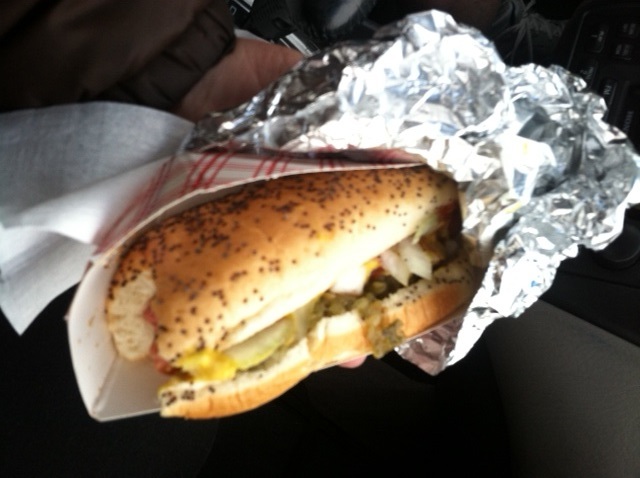 While a hot dog and cornmeal donuts aren’t the healthiest foods, they made for a delightful meal as we rushed to meet the train. 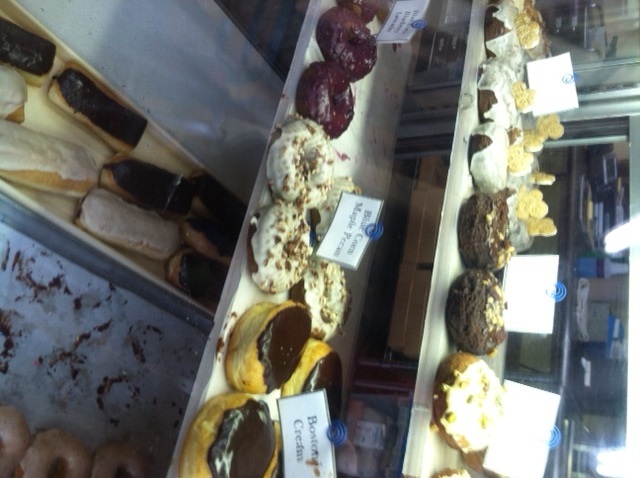 A variety of flavors at Whoo’s Donuts. Sometimes you just want a salad. At a rooftop table. Overlooking the Plaza. Steak and Cobb salads at Blue Corn Café. After two days exploring Northern New Mexico and Santa Fe, my sister and I were ready to celebrate the premiere of the new magazine I had just launched into Santa Fe. The party was that evening, so we decided to treat ourselves to a more expensive dinner than usual. The Bull Ring rang true as a prime steakhouse. 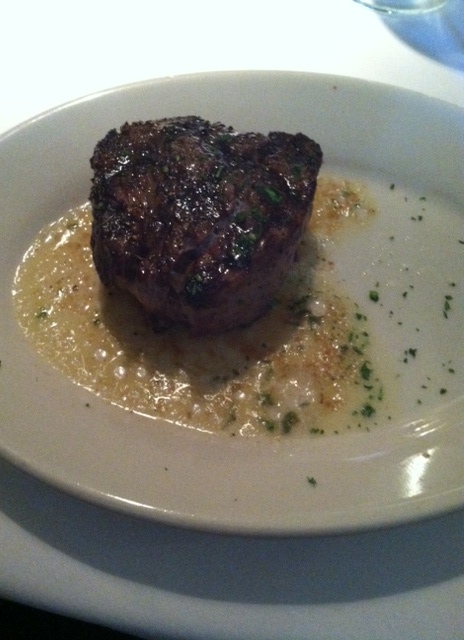 The petite filet at The Bull Ring. 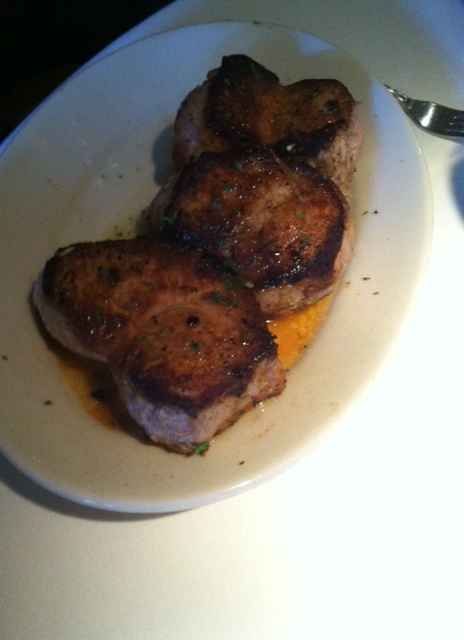 Blackened pork chops at The Bull Ring. 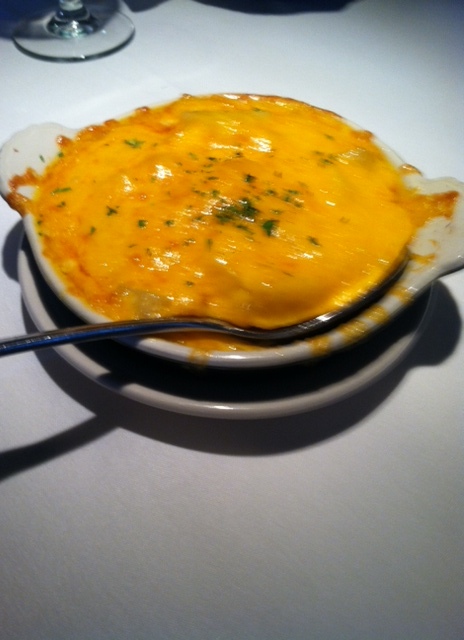 Au gratin potatoes at The Bull Ring. 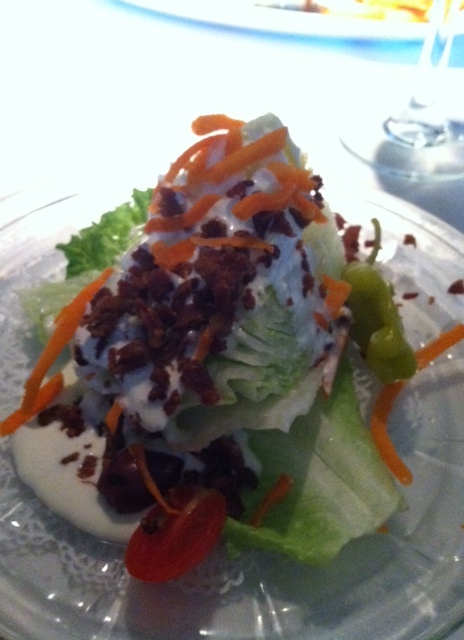 Wedge salad at The Bull Ring. 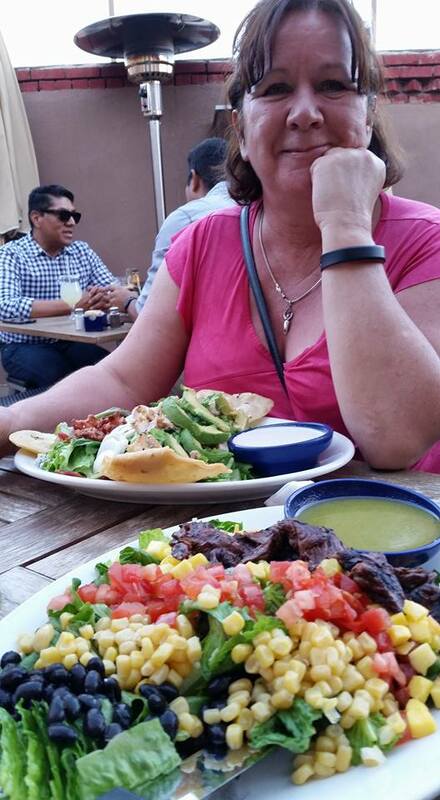 My friend, showing me around town, gushed, “We have to eat at Tomasita’s. It’s the best in Santa Fe. And their margaritas are fantastic!” On another trip, when a different friend said Tia Sophia’s in the best in Santa Fe, I told him about the first friend’s revelation. He said, “They have great margaritas. After a few of those, no one cares if the food is good or not.” While I enjoyed my meal at Tomasita’s that evening, after just one of those famous margaritas, I forgot to take a picture of my dinner. While everyone has a different opinion on which restaurant is the best, I can vouch that it was a mighty fine margarita. It was one those 300-some-odd days of sunshine a year in Santa Fe, so my sister and I decided to take the “high road to Taos” and visit Chimayo and some pueblos and churches along the way. Luckily we were flexible with our plans as we didn’t have a map and were relying on GPS on my phone to navigate. It never occurred to us that we might lose cell service in the mountains–and thus our navigation. Though we had a gorgeous detour while “lost,” we eventually made it to our ultimate destination: Rancho de Chimayo. 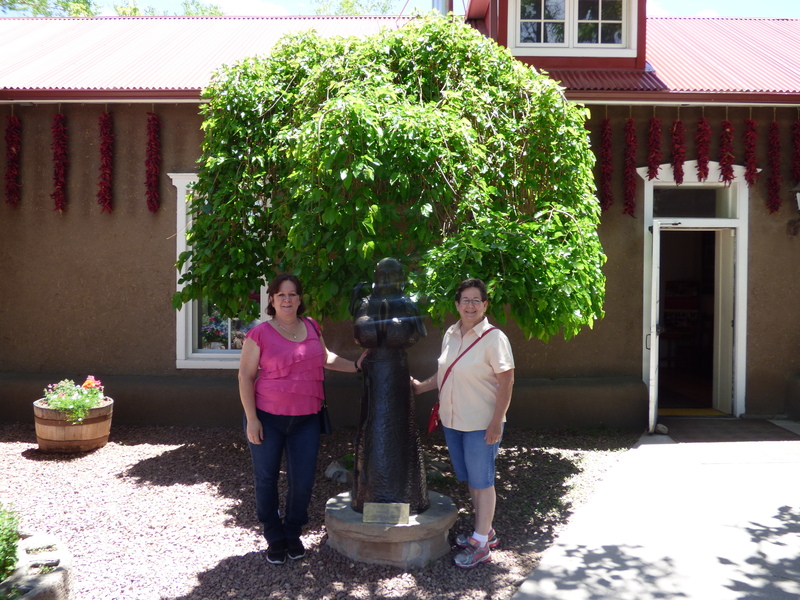 My sister and I outside Rancho de Chimayo. Lunch in the sun room at Rancho de Chimayo. Between the altitude and the longer-than-expected drive, we were both hungry when we arrived. Since my sister was driving, I indulged in a glass of wine. Rancho de Chimayo served up my favorite meal of the trip. Lunch at Rancho de Chimayo. 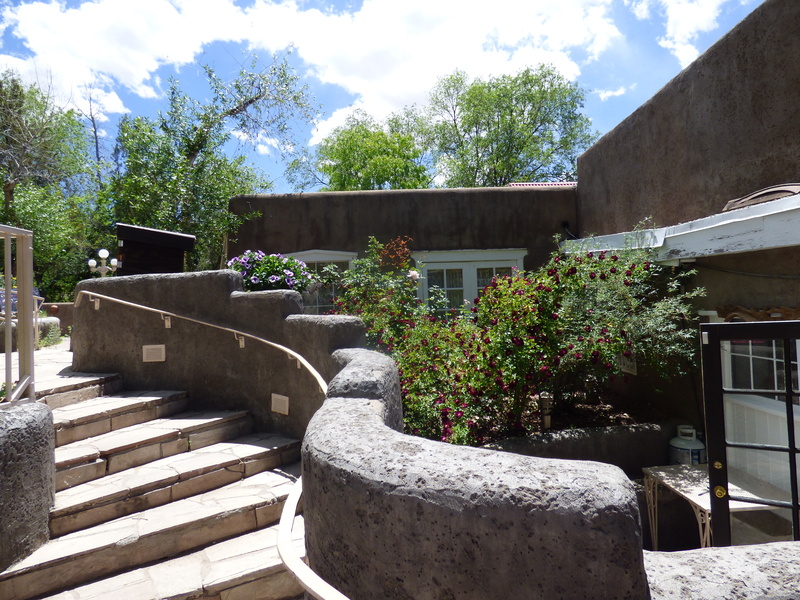 The steps leading to the back terrace at Rancho de Chimayo. I have yet to have a sub-par meal in Northern New Mexico. My advice: try it all, order the sauce on the side if you’re not sure of the heat in the chiles and take advantage of all the opportunities for walking on the Plaza and in nature to burn off some of the calories. You’ll need it.